All AO devices feature a piezo-electric transducer bonded to one face of a crystal material. When an RF drive signal is applied to this transducer, a travelling acoustic wave is generated in the crystal. Due to the photo-elastic effect the acoustic column produces a periodic change in the refractive index, similar in effect to the slits of a diffraction grating. Practical AO devices are designed such that a high proportion of the incident laser light is diffracted into a single output order. This is operation in the Bragg regime. Bragg diffraction requires a defined interaction length (L), and the laser light to be input at a specific angle. The Bragg and separation angles are a function of the optical wavelength, the RF drive frequency and the crystal acoustic velocity (V). Some AO crystal types require the input beam to be polarized. The RF drive frequency determines the output angle of the diffracted beam and the RF power determines the beam intensity. These are the basic control mechanisms of AO modulators and deflectors. Acousto-optic modulators (AOM) are used to control laser beam intensity. This can be simple ON:OFF modulation for fast switching or variable level modulation to provide proportional intensity control. These modes are determined by the RF driver type; digital or analog modulation respectively (or a combination of both). The RF drive frequency is typically fixed and the RF amplitude is modulated accordingly. The optical rise and fall time is defined by the laser beam diameter in the AOM and the crystal acoustic velocity. For high modulation rates, the beam will need to be focused at the AOM. All AO devices apply a frequency shift to the diffracted output beams. Acousto-optic frequency shifters (AOFS) are compact devices designed specifically for this task. 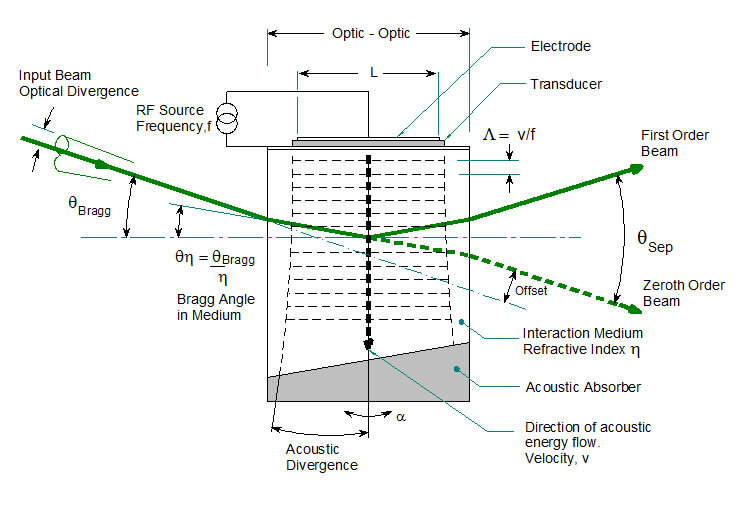 Depending on the selected Bragg angle, these devices will either up-shift or down-shift the laser light by the frequency of the applied RF signal. Two or more devices can be cascaded in order to achieve sum or difference frequency combinations. Compound absorber angles are incorporated to minimize acoustic reflections. AO deflectors can be used to scan a laser beam. This is achieved by changing the RF drive frequency. Random position, continuous line scans and sequential spot deflection are all possible. Scan rates in excess of 250KHz can be achieved depending on the crystal, wavelength and beam size. Off-axis AO deflectors (“OAD”) minimize the Bragg angle - frequency sensitivity by exploiting non-linear characteristics of birefringent crystals. Beam steered AO deflectors (“-BS”) electronically steer the acoustic column inside the crystal depending on the RF drive frequency. This requires a phased array electrode on the transducer with 2 or 4 RF inputs. Acousto-optic diffraction requires momentum matching between light and sound (acoustic) waves in the crystal material. For the AO laser beam modulator, momentum matching is maximized when the input beam is aligned at the Bragg angle. AOTF applications are different. Unlike the modulator case, AOTF’s are frequently used with non-coherent, poorly collimated light and require large apertures with wide acceptance angles. To accommodate these demands, AOTF’s utilize non-linear properties of birefringent crystals. The crystal orientation and acoustic launch angle are designed such that diffraction occurs over a very narrow wavelength range for a very specific RF frequency. In fact it is so specific that multiple simultaneous frequencies can be applied to an AOTF without excessive intermodulation. This allows controlled wavelength mixing. The acoustic launch angle and incident angle are related by design and together define the AOTF characteristics. Q-switches are intracavity devices used to generate very high peak power, short duration laser pulses. These are typically loss modulators operating on the zero order beam. The goal of a Q-switch is to diffract as much power from the zero order as possible to increase the cavity loss and extinguish the laser output. When the RF drive to the Q-switch is momentarily turned off, the optical power built up in the laser is emitted as a short pulse. The process may be repeated at rates in excess of 100KHz. Depending on the frequency and interaction length, AO Q-switches either operate in the Bragg regime, just like an AOM, with predominately a single diffracted beam or in the Raman-Nath regime with multiple diffracted beams. For ease of integration ISOMET offers a range of pre-aligned fibre assemblies and integrated fibre coupled devices for both modulation and frequency shifting applications. The FOA series offers an open and fully adjustable fibre coupling solution suitable for use with a wide range of our visible and NIR AO devices. The FCM series are fully integrated welded package fibre coupled devices. These exhibit high extinction ratio, low coupling losses and feature single mode fibres with FC/PC terminations.